One of the oldest (if not the oldest) surviving building on Edinburgh's Royal Mile, the Tolbooth dates from around 1591. 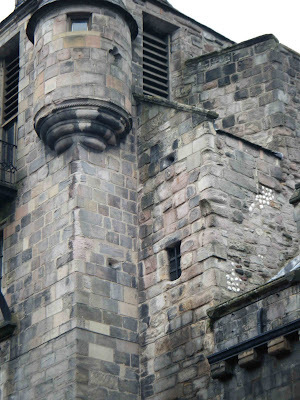 It is situated only a few yards West of the Canongate Kirk, and less than a quarter of a mile West of Holyrood Palace. 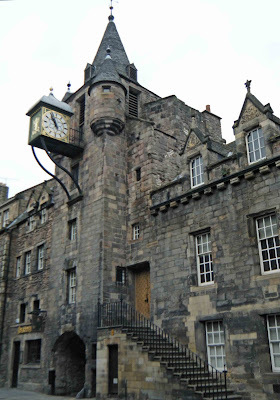 The Tolbooth was once the administrative centre of the Burgh of Canongate, which stood outside the city walls. It was built by Sir Lewis Bellenden of Auchintoul. Above. 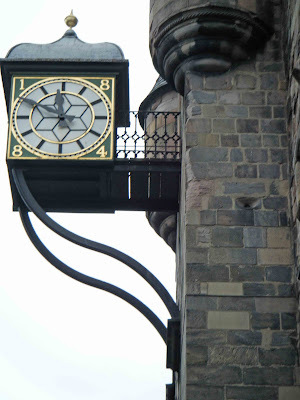 The clock on the wall of the Canongate Tolbooth. Note the tiny gun port to the right. This building is included on this web site on the basis of its two tiny gun ports high up on the wall (shown below) Some sources state that these are proper gun ports, used in the defence of this building when it was used as a prison....whilst other sources insist that they are purely decorative, much like those in Mars Wark in Stirling. I have to admit, that their tiny size would have made it almost impossible to see what you were shooting at once the muzzle of your gun was inserted into the hole. My guess is that they were probably inserted as a decorative addition to the building's exterior. Above. View of the two gun ports. One to the left of the small window, and one directly above the window. Above. View of the tolbooth from across the street. Above. View of the tolbooth looking East up Canongate. Check this link for some brief information on the museum housed in the old Tolbooth, The People's Story.